For those of you who have never visited Santa Barbara I can honestly say it is a beautiful little city with an incredible waterfront. We have gentle sloped sandy beaches that stretch for miles along our coastline. Due to the topography of California the coast makes a right angle turn at Point Conception, which gives Santa Barbara south facing beaches. The beach orientation, along with the protection of the Channel Islands, makes our beaches look very user friendly. I tell you this because of the false sense of security that has infected some of the visiting tourists. They rent a kayak for a couple of hours and without realizing it they get caught in the afternoon winds. On a few occasions a few of these tourists were picked up hanging on a buoy after their kayak went east with the wind. A kayak can get away from you faster than you could possibly swim in full kayaking attire. If you have your paddle in your hand, does it get in the way of you swimming after your kayak? I believe if you learn how to do a paddle swim you will have a better chance of catching your kayak in the event you let go of it. 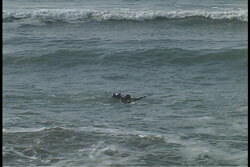 The paddle swim is also a powerful way of swimming through the surf zone. It does provide greater pull in the whitewater found in surf zones. The paddle swim is easy to do once you know how to do it. 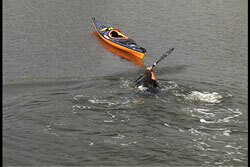 However, it feels clumsy at first and many paddlers have disregarded the skill because success was not immediate. I highly recommend you learn and practice this very valuable skill. The occasion you end up using it, could be life saving. When do you use the paddle swim? Whenever you find yourself with your paddle and without your kayak and you have to move across the water. I have also seen it used in a swimmer assist, which we will discuss later. 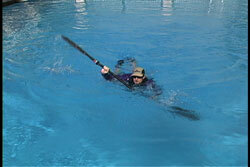 The most common way of performing the paddle swim is going forward just as though you are swimming. The main difference is the longer lever provided by the paddle. It takes some practice to get comfortable with the lever. The part of the skill that needs to be mastered is the way in which you manipulate the blades in the water. The angle of your blade when you put it in the water, the angle on the blade when you pull and the angle of the blade as you take it out of the water, all need to be correct if you want to move efficiently. If your paddle is feathered there will be more manipulation needed. Remember to use the knife-edge for the least resistance when the blade enters and comes out of the water. 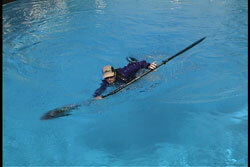 Use climbing blade angles to keep the blades from diving during the stroke. Do not pull on the blade until the blade is in the correct position after it enters the water. If it is not in the proper position your blade can slice quickly through the water, which is a wasted stroke. If it sliced downward you will find it very difficult to get the submerged blade up out of the water. The closer you keep both blades near the surface the less time it will take to set up for the next stroke. As you learn the coordination you will experience greater control, power and speed. Take your breaths when needed and time it so you don't get a mouthful of water. Keeping your head up out of the water forces your feet downward. While you want to keep an eye on your target, some paddlers find it difficult keeping their head up all the time. In addition, if you were to place your head in the water as if you were swimming, you may be able to kick with your feet for more forward power. 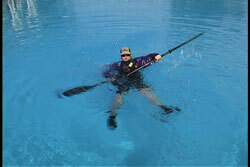 If you don't like the forward approach you can also try doing the paddle swim backwards. The main advantage to this variation is less strain on the neck. You will be doing a reverse stroke rather than a forward stroke. Some find the forward paddle swim tiring on the neck muscles. Switching to the backstroke could be a nice break while maintaining momentum. You will need to maintain a watchful eye over your shoulder. Some people like to see where they are going and some like seeing where they have been. The only way to see which one works better for you, is getting in the water and trying them. A way to get good at these strokes is racing your paddle partners. It seems to be more fun when some racing is involved. Use your feet to kick to add to your momentum with either the forward or backwards paddle swim if you can do it. When I am asked about the potential power of the paddle swim I relate a time when I saw the paddle swim used to tow a swimmer through the surf zone after a capsize. There was a lot of water moving in the zone adding to the challenge. The person being towed held on to the PFD of the paddle swimmer. The person being towed tried kicking their feet whenever possible. When you race your partners try doing it while towing another. If I don't have anyone to race I try chasing my kayak in protected waters. I get in the water and push my kayak ahead of me so I have a target to swim towards. It also provides an index to see how fast I am actually moving. Remember, on a windy day that kayak could be moving away from you very quickly so you need to paddle fast and hard to get to it. As a side note, if you ever find yourself in the water half way between your paddle and your kayak, I recommend you head for your kayak. If you are alone you will use your spare paddle (hint, hint), which is on the deck of your kayak to retrieve the one you abandoned. If you are in a group someone else can go for the paddle. 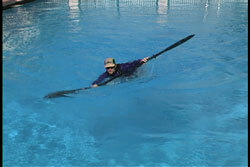 You could also hand paddle back to your paddle if you foolishly neglected to have a spare with you (tsk, tsk, tsk). Unattended paddles don't travel quickly in the water, but unattended kayaks do. 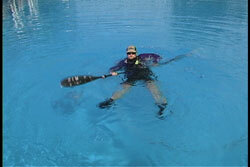 If you remember to never lose contact with you paddle and kayak, you should never need to face the situation. The more skills you have in your bag of tricks, the better prepared you will be for that potential emergency. In fact those skills keep incidents from becoming emergencies. A good time to practice this skill is immediately after landing from your day paddle. Since you will soon head to the car and change into dry clothes, it is a good time to see if you are dressed for immersion while practicing a new skill. 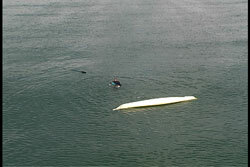 It is also a good time to try a quick capsize recovery to keep those skills honed too. Pictures seen above were taken from the USK Video "Capsize Recoveries & Rescue Procedures & ABC'S of the Surf Zone"